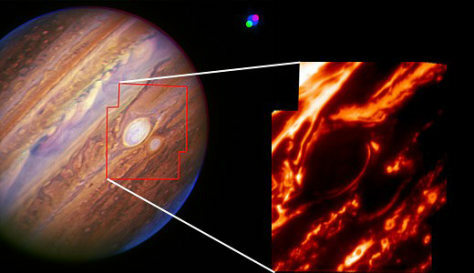 At left is a false-color composite near-infrared image of Jupiter and its moon Io, taken by the Keck II telescope. At right is a closeup of the two red spots through a 5-micron filter, which samples thermal radiation from deep in the cloud layer. Red Spot Jr. appears darker, either because its clouds are less dense or because the tops of the clouds are not as high as those of the larger spot.